The ecm uses signals from the output shaft speed sensor and input speed sensor to detect the actual gear position (1st, 2nd, 3rd or o/d gear). Then the ecm compares the actual gear with the shift schedule in the ecm memory to detect mechanical problems of the shift solenoid valves, valve body or automatic transaxle (clutch, brake, gear, etc.). 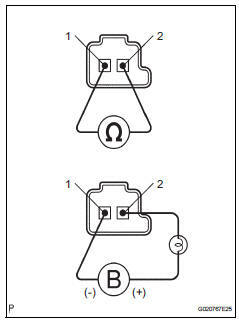 This dtc indicates a stuck on malfunction or stuck off malfunction of the shift solenoid valve sl2. The ecm commands gear shifts by turning the shift solenoid valves on/off. When the gear position commanded by the ecm and the actual gear position are not the same, the ecm illuminates the mil and stores the dtc. The data list can be displayed during the active test. Enter the following menus: diagnosis / enhanced obd ii / active test. Follow the instructions on the tester and perform the active test. While driving, the shift position can be forcibly changed with the tester. Comparing the shift position commanded by the active test with the actual shift position enables you to confirm the problem (see page ax-31). This test can be conducted when the vehicle speed is 50 km/h (31 mph) or less. The shift position commanded by the ecm is shown in the data list/shift display on the tester. Enter the following menus: diagnosis / enhanced obd ii / dtc info / current codes. Read the dtcs using the tester. If any other codes besides p0776 are output, perform troubleshooting for those dtcs first. Remove the shift solenoid valve sl2. Check the transmission valve body assembly. Ok: there are no foreign objects on each valve. Check the torque converter clutch assembly (see page ax-153). Ok: the torque converter clutch operates normally.